Dishwashers are widely used to clean dishes in hotels, restaurants and other commercial kitchens. Commercial dishwashers are more efficient than household dishwashers and provide other functionality such as sterilizing of dish wares. Commercial dishwashers market is driven by the factors such as product innovation for reducing energy and water cost, labor costs and chemical costs. Advanced commercial dishwasher machines help in reducing total cost of commercial dishwasher ownership. For instance, Bosch's Zeolite technology uses zeolite crystals to heat the interior of dishwasher without consuming electricity. Moreover, big companies are also acquiring their competitors to sustain the market competition and to expand their business in other regions as well. In 2014, Whirlpool, a U.S. based electric appliances manufacturer, acquired majority stake in Hefei Rongshida Sanyo Company, based in China. Though, Whirlpool has its presence in higher-tier cities of China from two decades, upon completion of acquisition Whirlpool's presence expanded to rural markets of China too. Whirlpool also acquired majority stake in Italian appliance maker Indesit Company, with 60% ownership of Indesit. This acquisition expands Whirlpool's presence in Europe, as Indesit is one of the major market players of electric appliances in Western Europe. Sustainable cleaning technology and energy saver machines are gaining momentum as they are more efficient and environment friendly. Commercial dishwasher machines consume significant volume of electricity to heat water that is used for cleaning dish wares. Growing preference for advanced features that reduce operating cost and reduce consumption of water and chemical agents used for cleaning are likely to impact sales of commercial dishwashers across the world. Product innovation and new technologies that are capable of saving water and electricity are in great demand in hospitality sector, significantly driving the growth of global commercial dishwashers market. Rising number of hotel and restaurant chains across the globe is one of the key factors driving the demand for commercial dishwashers. Growing hospitality sector in Middle-East and Asia-Pacific region showcase vast opportunity for market players to expand their businesses in these regions. However, rising cost of raw materials such as stainless steel is expected to hinder growth of dishwasher market as steel prices directly impacts the production and pricing of commercial dishwashers. The global commercial dishwasher market valued USD 0.73 billion in 2016 owing to growing hospitality sector in Asia-Pacific and Middle-East region. Global commercial dishwashers market is expected to expand at a CAGR of 4.1% over the forecast period. Further, the market is projected to reach USD 1.80 billion by the end of 2024. Geographically, North-America region dominated global commercial dishwashers market with more than 25.0% share of revenue in global market in 2016. 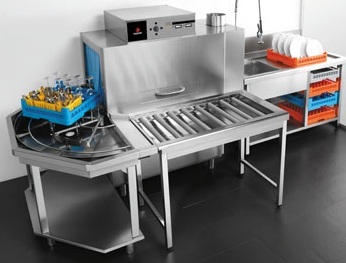 U.S. accounts for more than 1 million restaurants, which are significantly increasing in the country and expected to propel the growth of commercial dishwashers market. North-America is closely followed by Europe with more than 20.0% market share in 2016. Asia-Pacific region also shares significant market share owing to rapid urbanization and rising hospitality sector. Middle-East commercial dishwashers market is expected to grow significantly over the forecast period owing to huge hospitality sector backed up by the expansion of tourism industry in gulf countries.